Physical characteristics: Helmeted hornbills are large, dark brown and white birds with short red bills. They have high, nearly solid, heavy casques, and long, white tail feathers. Adults are 37.4 to 41.4 inches (110 to 120 centimeters) long, with females weighing between 5.7 and 6.3 pounds (2.6 and 2.8 kilograms) and males weighing about 6.7 pounds (3.1 kilograms). 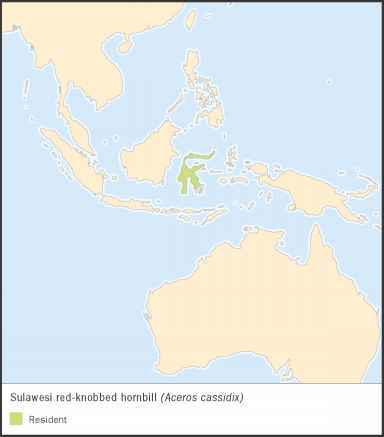 Geographic range: Helmeted hornbills are found in South Myanmar and south Thailand, Malaysia, Sumatra, and Borneo. Habitat: They prefer rainforests primarily at a habitat below an altitude of 4,900 feet (1,500 meters). Diet: Helmeted hornbills eat many different types of figs. Behavior and reproduction: They are believed to be territorial. The species has a distinctive loud call that includes a series of introductory "tok," followed by a flowing laughter-like sound. Both sexes regularly engage in strange, aerial hammering and head-butting behaviors with the use of their casque, especially near fruiting fig trees. Little is known about the reproduction of helmeted hornbills. Females breed throughout the year, but in southern Sumatra, fledglings are usually found between May and June. Helmeted hornbills and people: People in Southeast Asian cultures consider the helmeted hornbill to be one of their most significant species. They are widely hunted for their feathers and casques ("ivory") that are valued for traditional dances and ceremonial decoration. Illegal carved casques are still traded internationally.